There is no more obvious or mundane fact about human behaviour, feelings and thoughts than that we often like sweet foods and drinks. 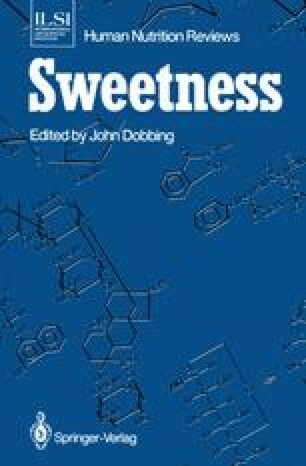 Nevertheless, practising food scientists are aware how complex are the roles of sweeteners in the perception and acceptance of food. The influence of sweetness on food selection is a mental process influencing an individual’s behaviour. Therefore its scientific investigation cannot rely simply on polling of opinions, whether by aggregate market or dietary survey responses or by the more sophisticated statistical treatment of numbers produced by members of selected panels in answer to questions about food samples. Sensory testing coordinated with market research in the food industry as well as medical or dental research into disease-preventing behaviour would be advanced by objective measurement of influences on individuals’ eating and drinking behaviour, using cognitive methods from experimental psychology (e.g. Poulton 1968; Fishbein and Ajzen 1976). However, such aspects of so-called hot cognition have yet to engage the attention of mainstream academic psychology (Booth 1986) and so this review can do little more than point to a way forward.